mapr exportstream and mapr importstream are used together to export data from MapR streams into binary sequence files, and then import the data from the binary sequence files into other MapR streams. So we can use the 2 tools to do cold backup/restore. After that, mapr diffstreams can be used to check the differences between the 2 streams. mapr formatresult can be used to parse a sequence file generated by mapr diffstreams. The backup size is even smaller -- 100MB. drwxrwxrwx 3 mapr root         1 Apr 26 07:09 ..
drwxr--r-- 2 root root         3 Apr 26 07:09 . This means the compression ratio of the backup could be better than the source stream itself. The target stream size is similar as the source stream. Here we can see 1500000 messages difference. This could be due to the "dead" messages in source Stream which passed TTL(7 days by default). This means that "mapr streamanalyzer" could count the "dead" messages also. But interestingly after one day, I re-ran the "mapr streamanalyzer" and then the count of 2 streams match. 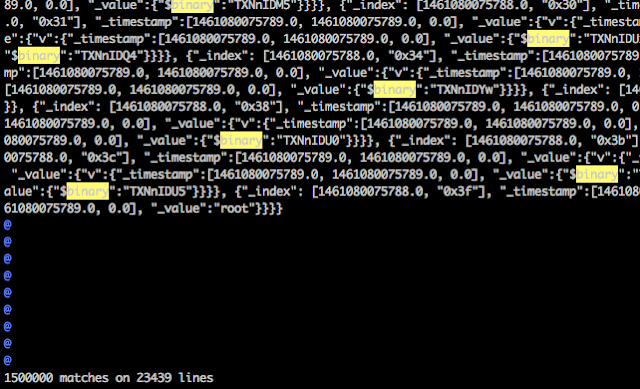 Note: This difference is because my ntp service is not in sync among nodes. To prove that the different messages in #3 is due to "dead" messages, we can use "mapr diffstreams" to check the difference. The output will be stored in MFS directory "/tmp/diff". Interestingly the different "row" count is 23439 instead of 1500000. Why? No hurry, I will explain and dig deeper in the next step. The output of diffstreams is sequential file. So we need to use "mapr formatresult" to parse it into readable text format. The row count of this output file is 23439 which matches the row count in step #4. However the actual count of messages is 1500000 because each row has multiple messages in that output file. Because the value of each message is stored in binary format in that output file, one easy way to count the # of messages is to count the # of word "binary" in that file. This can be done using "vim" unix tool , and you just need to type ":%s/binary//gn" when using "vim". From the output in step #5, you can get the epoch timestamp of the mismatched messages. Take 1461080075789.0 for example, if you convert it to readable human time, it is actually April 19, 2016 at 8:34:35 AM PDT which is 7 days ago comparing to when I did the tests. 1. "mapr streamanalyzer" may count the "dead" messages in stream, if time(npt) is not in sync among nodes. 2. "mapr diffstreams" output shows the count of rows != the count of messages.